In May, 2018, RiseVT granted the Haston Library in Franklin, VT a grant of $300 to support the activities described in our grant proposal. The Haston Library is the home of the Library’s Children’s Garden. 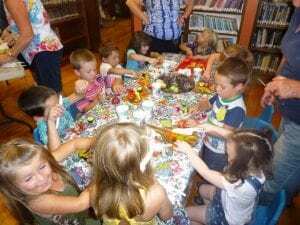 In the spring, the children at the Franklin Central Preschool came to the Library and worked with Virginia Holiman, a children’s farm to school educator, to plant the garden with cherry tomatoes, purple beans, squash, cucumbers, radishes, peppers, green onions, kale, basil and mint. 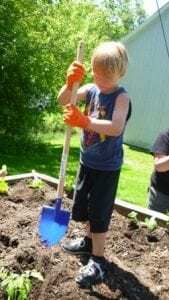 Over the summer, the children were encouraged to come to the library and water the garden. 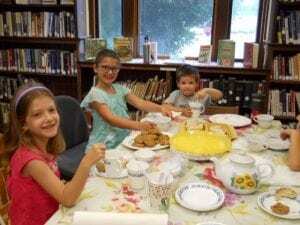 In July, the Haston Library and Ms. Holiman hosted a Fairy Homes and Tea Party, using some of the herbs grown in the garden for their herbal tea, along with having cucumber sandwiches and making fairy homes. In September, the children returned to the Haston Library for the “Harvesting the Garden.” Ms. Holiman presented a program to the children, to help children learn about how seeds grow into plants. Afterwards, everyone went outside to harvest the garden. The children thoroughly enjoyed getting into the garden and picking everything. They washed all the vegetables and then using child-safe knives, they cut the softer veggies – tomatoes, peppers, cucumbers, and green onions. All vegetables were put into a large cooking pot, which Ms. Holiman took home to cook into vegetable soup. The following day, the children, Ms. Holiman, and the Haston Library director met for “The Taste of the Garden,” which is a multi-generational program where the pre-school children visit senior citizens at The Homestead, which is a senior retirement complex, located in Franklin, Vermont. 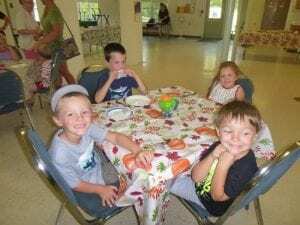 The residents of the Homestead and the children from the Franklin Central Preschool were seated at tables and served bowls of Vegetable Soup. The soup gathered a mixed reaction from the children. Some of them loved the soup. Some only liked the broth and some didn’t like it at all, but they all tried it. In October, the Haston Library hosted a Fall Festival/Tractor Day, which invited all residents of Franklin to the library for fun activities and a taste of some healthy, local treats. The RiseVT Smoothie Bicycle was brought to the library and was a very big hit with the children who came to the event. The volunteers couldn’t keep refilling the smoothie blender fast enough for the number of children who wanted a ride on the bicycle. The children were also invited to paint a stencil on a t-shirt while at the Tractor Day. Aside from the bicycle smoothie, this was the other big hit with the children. An assortment of sizes and colored t-shirts were available, as well as six different stencils. The children got to paint their own t-shirts with the stencil of their choosing. While the t-shirts dried, there were other active games and crafts for the children and families to enjoy. The money provided by the RiseVT Mini Grant was greatly appreciated and put to use to provide fun, entertaining, and educational programs for the children of Franklin, VT.